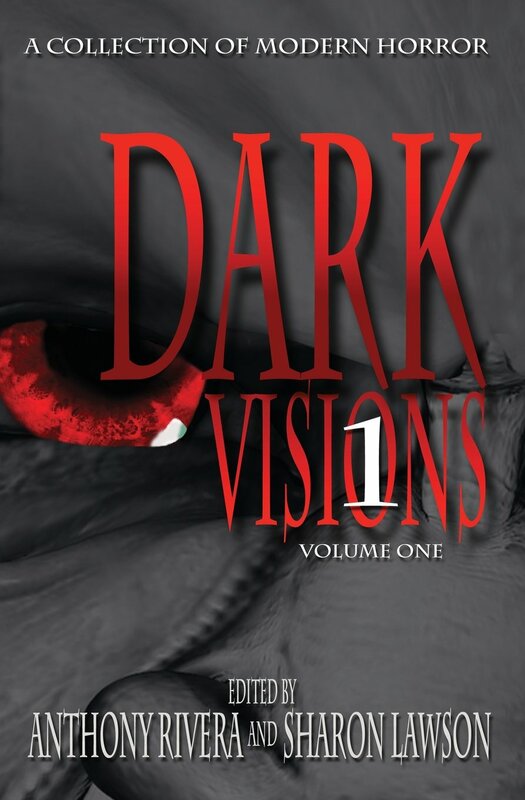 Short stories can be a tough format and it's not always my favorite genre, but when done right, a book of short stories can be just the thing, and Dark Visions definitely was very engrossing (sometimes with the emphasis on gross). 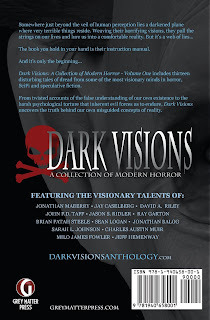 The collection, a quick read at just 13 stories, is put out by Grey Matter Press, and I have to say I love the implied optimism in the "Volume 1" of the title. Things get off to a quick start with Jonathan Maberry's "Mister Pockets" a small town story that reminded me in all the best ways of Stephen King's work. This twisted tale focuses on a hapless chubby 12 year old nicknamed "Lefty" by his baseball-loving dad. Lefty lives in a town called Pine Deep, which has previously experienced something they now call "The Trouble". They are in no hurry to experience it again, and all the neighborhood kids know not to be out after dark. The titular character, Mister Pockets, is the town's only homeless person, and Lefty notices that despite his personal filth, Mister Pockets "had the whitest teeth. Big and white and wet". Throw in some more tooth imagery and a random John Goodman reference, and this story had me hooked. Other standout stories for me included "The Weight of Paradise", by Jeff Hemenway, which posits a mysterious drug that makes you immortal, if only you can keep finding fresh people to pass it along to. Unfortunately for some of the recipients, when you decide to opt out, it's not so easy. Sarah L. Johnson's "Three Minutes" had a dreamy quality that quickly turned nightmarish, and a highly memorable main character in foster kid John, whose attempts to hold his breath underwater for a full three minutes have unforeseen consequences. "Second Opinion" by Ray Garton may have been my favorite story, a tight study of a writer desperate to find the perfect ending for a story, no matter what he has to do to make it happen. David A. Riley's "Scrap" had a gritty cinematic feel - the story of two down-and-out brothers looking for scrap metal to steal and sell, until they venture into a part of town best left untouched. Milo James Fowler's "What Do You Need?" was another page-turner, with a narrator trapped in a hotel room that has no connection to the outside world, other than a disembodied voice at the other end of his phone asking only "What Do You Need?" whenever he picks up the receiver. This one would have made a great "Twilight Zone" episode. And it's followed up by another strong entry in Jonathan Balog's "The Troll", in which a bullied middle-schooler finally meets the troll under the bridge, and is thrilled when it seems all of his dreams will shortly be coming true thanks to the troll's "helpful" suggestions. "Delicate Spaces" (Brian Fatah Steele) describes a world in which some spaces (in this case, a specific hotel hallway) radiate with evil - and who among us hasn't felt that chill on the back of their neck in one room or another in our lives? "Raining Stones" (Sean Logan) had an apocalyptic bent and a terrific ending. The collection moves on with "Show Me" by John F.D. Taff, another story that could easily have been a "Twilight Zone" or "Alfred Hitchcock Presents" entry, featuring a college student who is mostly a mystery, other than campus gossip about his supposed sexual endowment. Last up is "Thanatos Park" by Charles Austin Muir. Although not my favorite story, this entry had beautifully descriptive language in its telling of two paranoid losers living near the worst part of town and watching the dregs of humanity roll by. 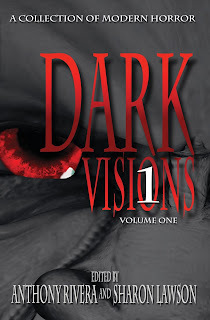 Hardcover Honey Verdict: Four creepy Bookworms out of Five for horror lovers - and I will be waiting for Volume 2 even if it does keep me up at night!